Evenflo Mega Splash ExerSaucer is a bright, fun-filled entertainment experience that offers developmental and exercise benefits for baby while providing parents with a safer alternative to walkers. Key Features: Rock, spin and bounce actions provide baby with plenty of exercise to strengthen legs, back and neck. Helps baby develop motor skills, object exploration, cause/effect learning, self-awareness and hand-eye coordination. Allows baby to exercise without the dangers of walkers. 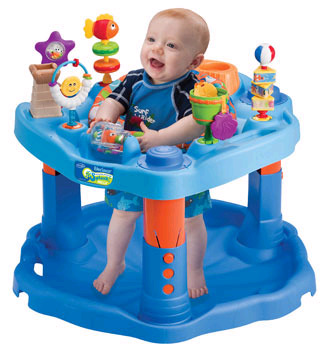 The ExerSaucer MegaTM Splash tabletop toys provide a variety of entertaining play functions to keep baby interested. Marbleized tray and machine washable seat pad with bubbles create a fun, beach play experience for baby that’s also easy to clean. Three height adjustments accommodate growing baby. No tools required for quick and easy assembly. Win an Evenflo Mega Splash ExerSaucer. Simply tell us what you think is the best 2009 film for dads and kids to watch together and why. Send in your answers using the comment form below. Last date for entries is February 15, 2010.